Between 1767 and 1846, war and intrigue dominated the Indian sub-continent. War constantly flared between the Indian kingdoms, both against one another and against the British and French interlopers. The Europeans, meanwhile, also busily fought each other. Indian Empires is a complete game, using the same game engine as Soldier Emperor, our strategic game of the Napoleonic Wars. It can be played separately, or together with Soldier Emperor; our Dreams of Empire book includes a linking map and the rules and pieces for its use. 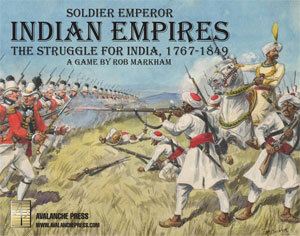 Indian Empires is a new edition of our long out-of print Soldier Raj. It includes over a dozen scenarios from Hyder Ali's defeat of the British in the First Mysore War in 1767 to Britain's final conquest of the Sikhs in 1846. Colorful leaders of the time are all present: Hyder Ali and Tippoo of Mysore. Sir Arthur Wellesley, the "sepoy general" who would become Duke of Wellington. The brilliant Madhav Rao of the Marathas. France's Admiral Suffren. Zaman Shah of Afghanistan, and the Sikh ruler Ranjit Singh. These and more lead your armies. The playing pieces are decadently thick tiles; pieces like the Mysore Tiger Soldier or the Maratha War Elephant are original works of art by Terry Moore Strickland. As in Soldier Emperor, successful card play is a key to victory. 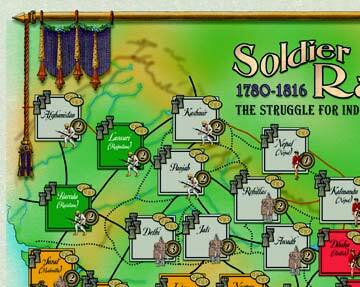 As in Soldier Emperor, players command their nation's military, political and economic destiny. The map is a painting of South Asia, with a network of areas and routes between them laid over it. Generals move their armies along these routes, attempting to conquer territory for their nation. Fleets control the seas around India; the locals have very little seapower, and Britain outnumbers France on the seas. Combat is resolved by dice rolls, with larger armies casting more dice. Good generalship is even more crucial in India than in Europe. Players win by taking the most territory, or by destroying their nation's enemies. Click here to order this great game.